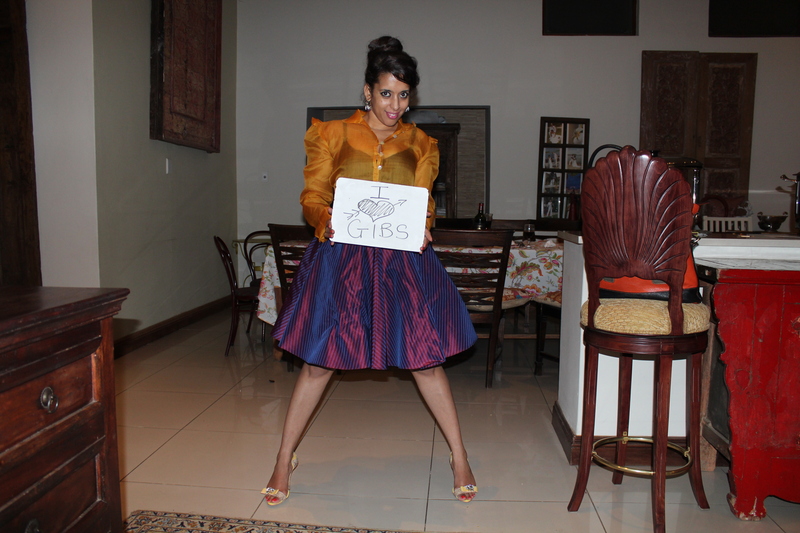 Yes, Spring has finally Sprung….the weather in Jozi has been glorious. It felt as though Winter would go on forever, and suddenly the willow tree is coming alive again! It’s the best thing about our garden…the long drooping branches of the willow that showers us with a crisp coolness on long Summer days! 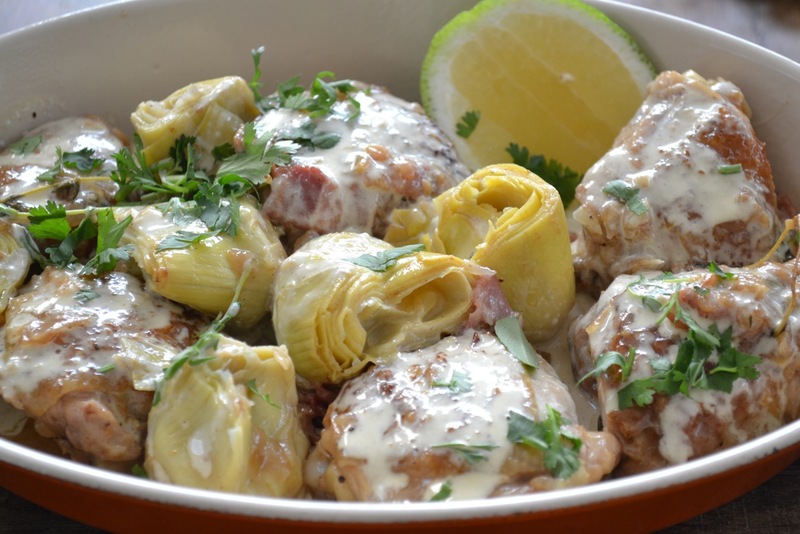 Although I do love curries, soups, stews and casseroles…enough to enjoy them anytime of the year, I sometimes ‘lus’ for lighter meals….grilled meat or fish that can be thrown onto a pan and served with a drizzle or salad. I love spicy foods and curries but also find a seared beef fillet irresistible! 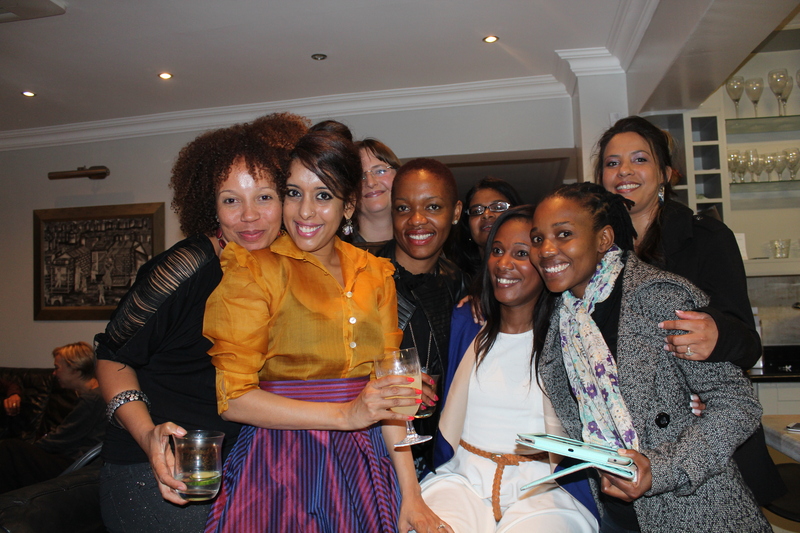 The girls…Cohort 7 GIBS Goldman Sachs Scholarship Programme 2013! My dear friend and GIBS 10000 women colleague, Mandisa Bardill, messaged me last week for my marinated beef fillet recipe. First a little about Mandisa…how could I best describe her….a singer, a songwriter, a businesswoman, a friend and the ‘Hummingbird’ of our group! Mands raved about the marinated fillet after trying it at one of my home dinner parties…it was one of our mad, crazy feasts, actually! That was a party to remember…us girls in party mode ready to rock on….and believe me, these ladies are a unique and talented bunch! 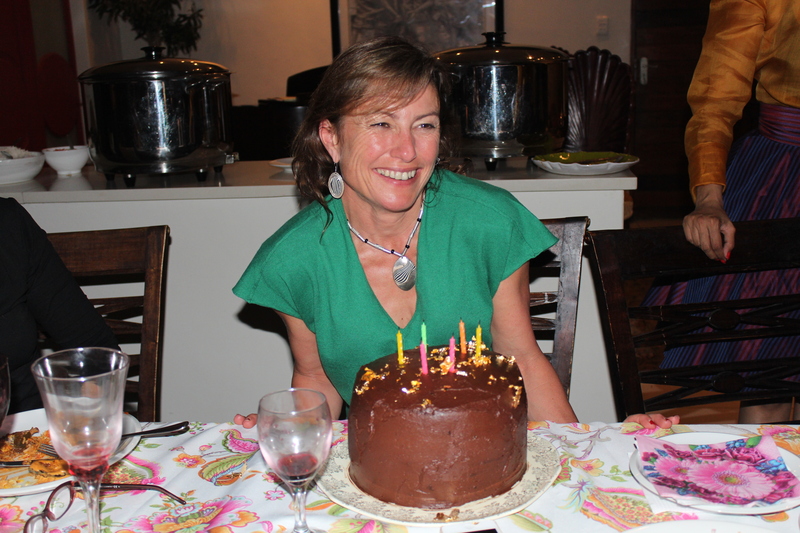 Sue Anne Stander….oh crumbs….she has done it again! 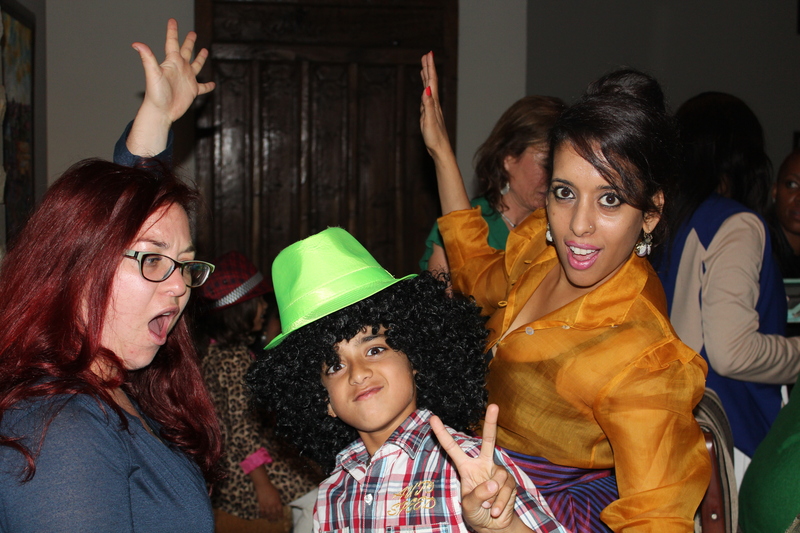 Even my kids got into party mode….firstly, by serving our guests and then having some fun! 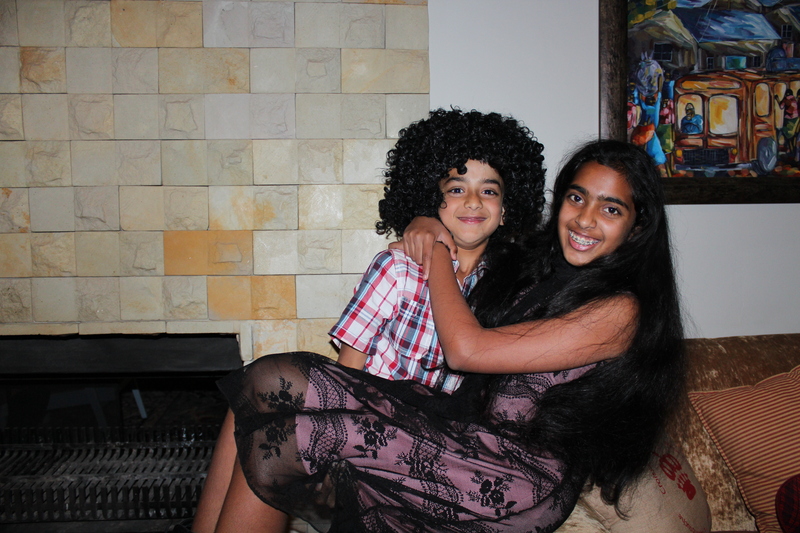 Rushil and Hetal…having some fun! One dessert is just not enough…..creme brulee was also on the menu! Most of the girls on the scholarship programme had never met before, but I am sure that most of us made new friends….not acquaintances but real friends for life! I was very privileged to be a part of my little group and we called ourselves….’The Pussycat Dolls’ or the ‘Elevator Witches’! 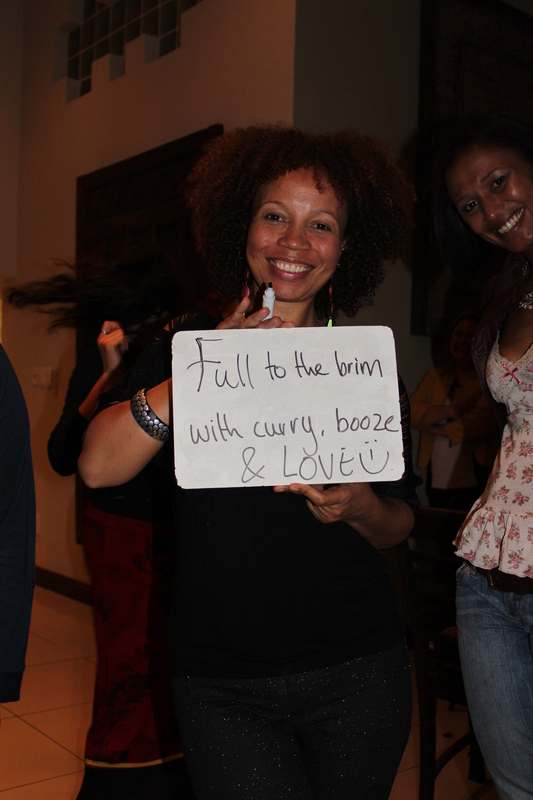 We always sat together…every class bucking the advice to mix and mingle! Hats off to the course directors who had to get us in line and keep us on track….Korkor Cudjoe, Yogavelli Nambiar, Catherine Burnard and Misha Dhana – the Gibs team really did have their hands full! 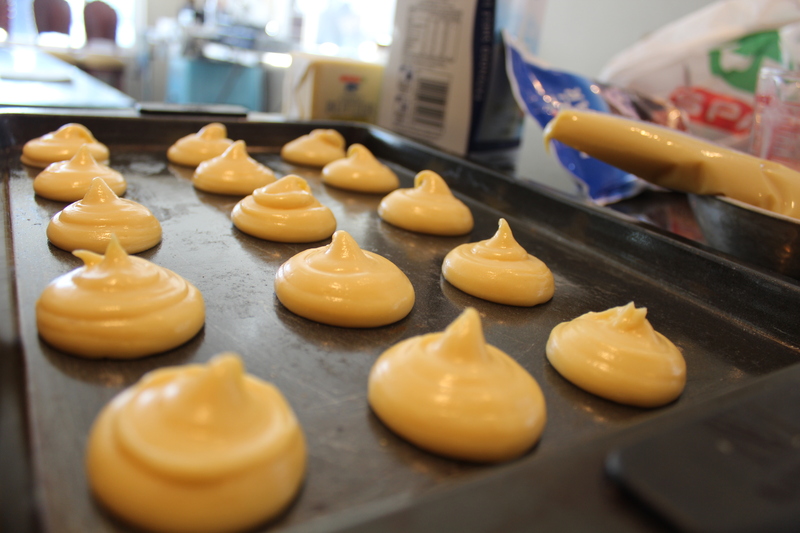 Back to the recipe….without further delays…. Remove the fillet from the refrigerator and allow the meat to stand until it is at room temperature. Place the meat on a chopping board and using a sharp knife trim the fillet and remove the silvery skin. Season the fillet with seasoned salt. Heat an AMC skillet on high until it is smoking hot. Place the seasoned fillet on the skillet and pour the sunflower oil over. Sear the fillet until it caramelises on the outside. When the meat is caramelised, remove from the pan and wrap it in foil. Leave the meat to rest for fifteen minutes. The fillet continues cooking while it is resting. 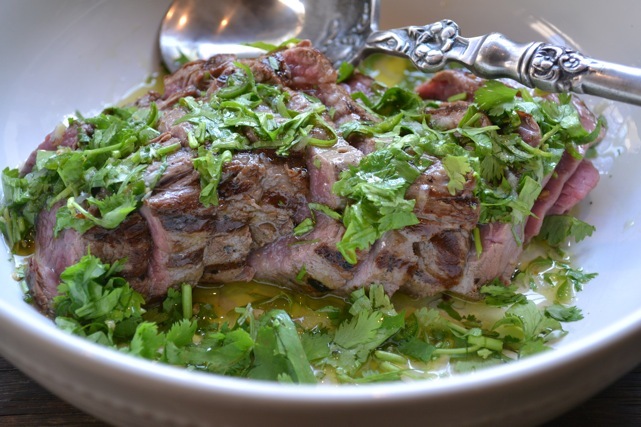 While the meat is resting, combine the lemon juice, crushed garlic, green chilli, olive oil and chopped coriander. Place the meat on a chopping board and slice thinly. If the meat is undercooked, grill again on a hot pan. Arrange the meat on a platter and pour the lemon and olive oil mixture over the fillet. Beef fillet is one of the most tender cuts and also the most expensive. Ask your local butcher to trim the fillet for you as this saves time. You can slice the fillet into portions if this makes searing them easier. Always pour the sunflower oil into the skillet once the meat has been added. The oil can catch alight when it is poured into the pan before the meat. This can be prepared rare, medium or well done according to your taste but the cooking time should be adjusted accordingly. Thinly sliced beef fillet is an impressive snack and it can be served at room temperature. Rina and I at Belnori Boutique Cheesery…. 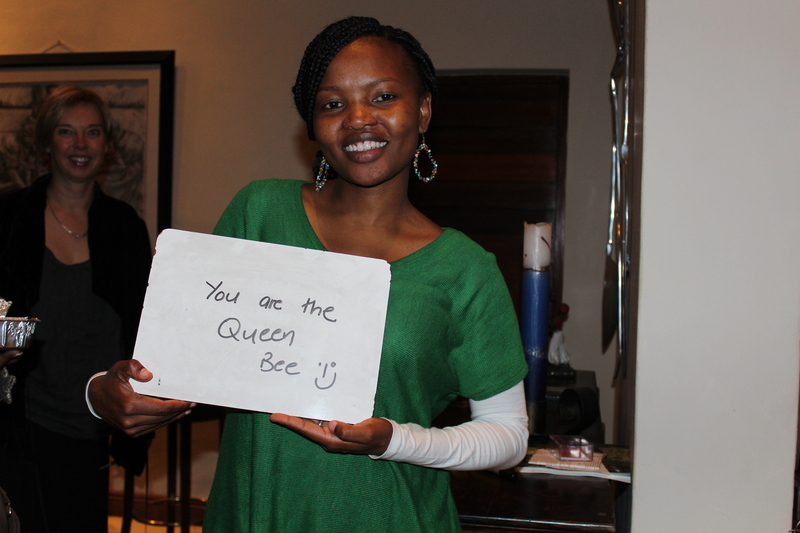 My first episode took the team and I out to Bapsfontein to Belnori Boutique Cheesery and it was a real treat. I was set on making paneer and thought it would be a great idea to try it with goat’s milk. 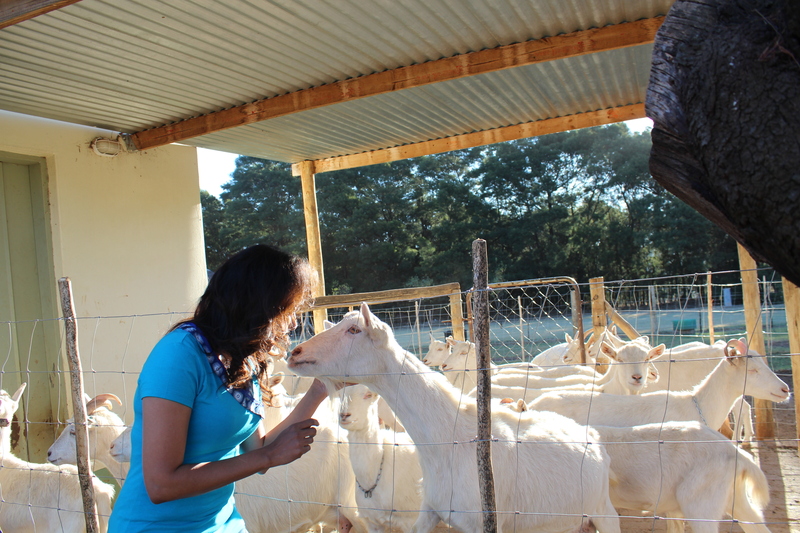 We were met by the owners, Rina and Norman Beicher – this couple is really passionate about goats and cheese, of course! They produce an extensive range of award-winning cheeses. I am an absolute fan of ‘Chevre Frais’ or the soft goats cheese so I didn’t need much coazing to get started on the tasting! 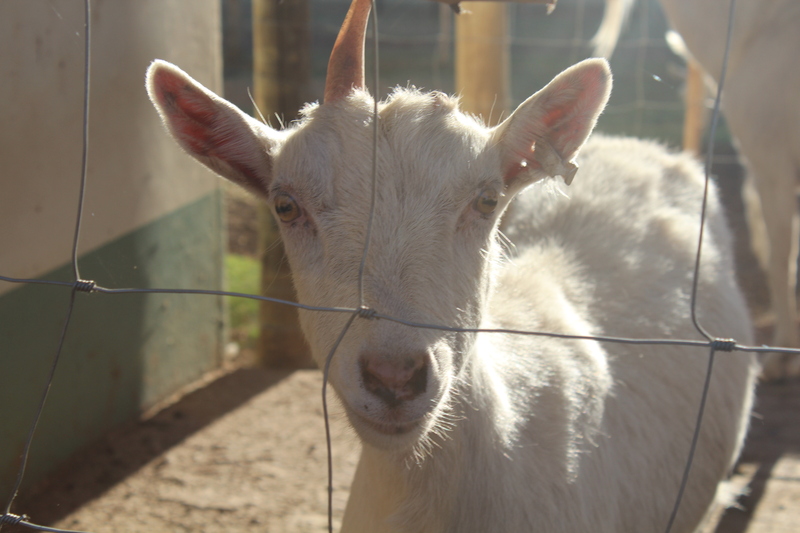 The stars of the show….The Goats of Belnori! Goats…I do love them! 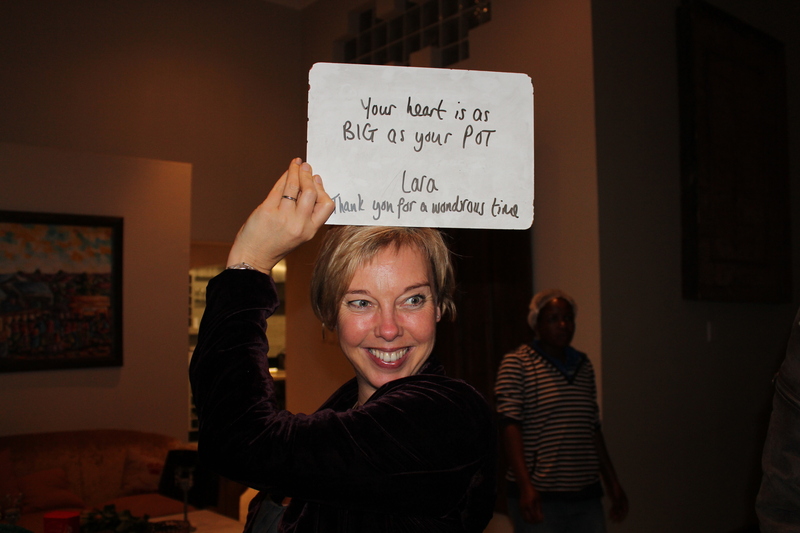 I think I must have fallen in love with these creatures at the Fairview Estate! I absolutely love the curiosity that sparkles in their eyes, their animated silliness, and they are incredibly mischievous! Rina was an absolute charm and took me through the range of from cottage cheese to semi hard varieties, camembert and even yoghurt! But it was the fresh goats milk that i was after! I have sometimes tasted goats milk and cheese that was pretty unpleasant. Rina explained that the ewes are kept away from the rams and bathed regularly….it all comes down to good animal husbandry, she said! 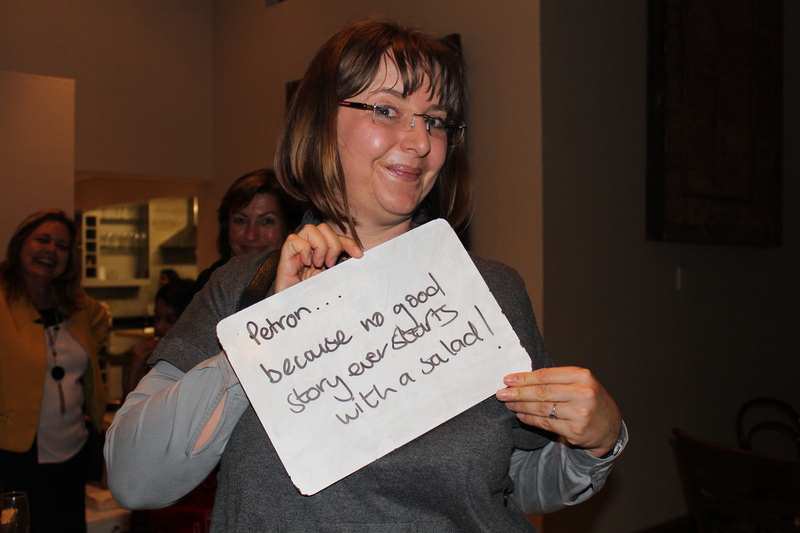 Tasting the products, I realized that she had a point…there weren’t any ‘goaty’ flavours in the yoghurt or cheese! Belnori is a gem! 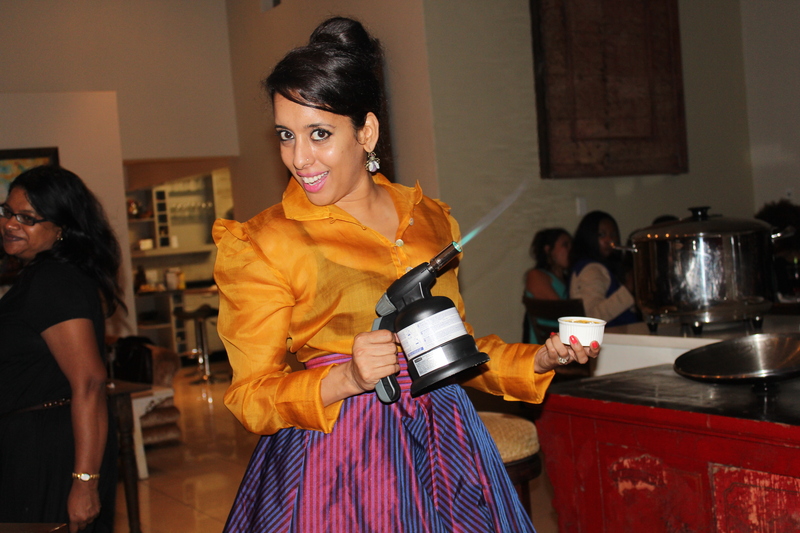 I picked up a bucket and then hustled back to Holi Cow to prepare a batch of paneer! Cow’s milk can be used instead in this recipe…but if you are feeling adventurous, give the goat’s milk a chance! A word about paneer…it does take some time to prepare so please do use a good pot for the preparation. I used the AMC paella pan, which is wider at the top. Use a paddle spoon to stir the milk as it heats through to prevent the milk from scorching which gives the paneer a nasty burnt flavour. I also prefer making up a larger batch of paneer so you get thicker, chunkier pieces and it can be kept in the refrigerator for a few days or even frozen until needed. 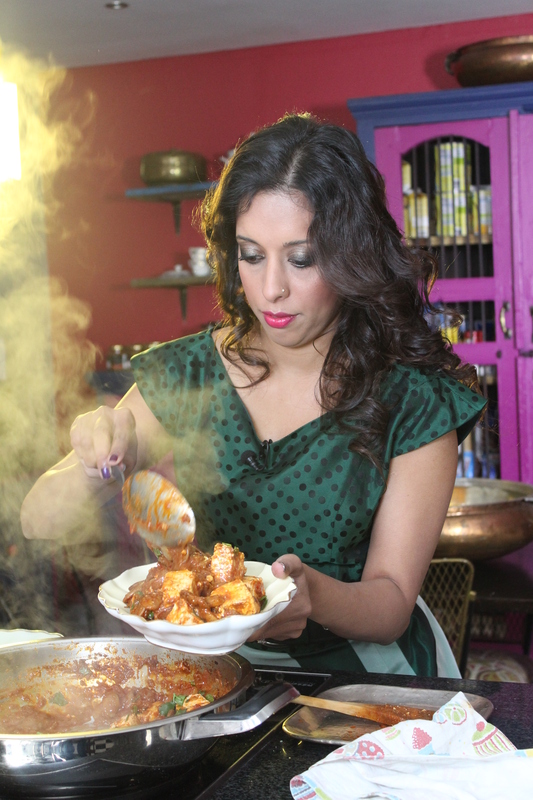 In the first episode, we got through two recipes…the preparation of the paneer and a double bean curry with creamy paneer! Double beans can sometimes be found in Fruit and Veg City stores and almost always at Indian greengrocer. They are bright, colourful, and delicious. 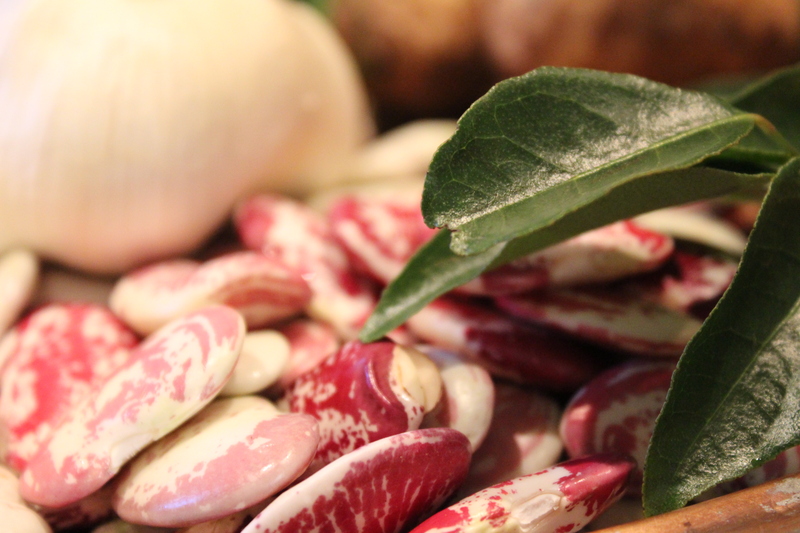 Fresh double beans from the Indian green grocer….. Boil the full cream milk in an AMC pot. Stir the milk to prevent a skin from forming. Prevent the milk from burning by scraping the bottom of the pan. Once the milk comes up to the boil, add the vinegar. The curds will separate from the whey. If the whey still looks milky, add a little more vinegar. Do not stir the milk – this will break the curd that will be difficult to work with. The curd will float to the top and form a thick layer. Gently scoop the curd into a sieve using a large slotted spoon. Gently press the curd down with a spoon to remove excess moisture. Tip the curd into a clean dishtowel and mould into a round. Wrap the curd tightly and place on a chopping board. Fill a large pot with water and place this on top of the paneer to press out the whey. If the paneer is too soft, unwrap the cheese and leave uncovered in the refrigerator. Heat the sunflower oil, then add the mustard seeds and fry until they splutter. Add the cumin seeds and fry until they turn a shade darker. Add the onion and sauté until the onion turns light golden brown. Stir the ginger and garlic paste into the onion, then add the red chilli powder, cumin, coriander and turmeric – stir for 3 – 5 seconds. Drop the double beans into the pot and stir well to coat. Cover the beans with boiling water and simmer until they soften. Cut the paneer into chunks and place them over the cooked beans. 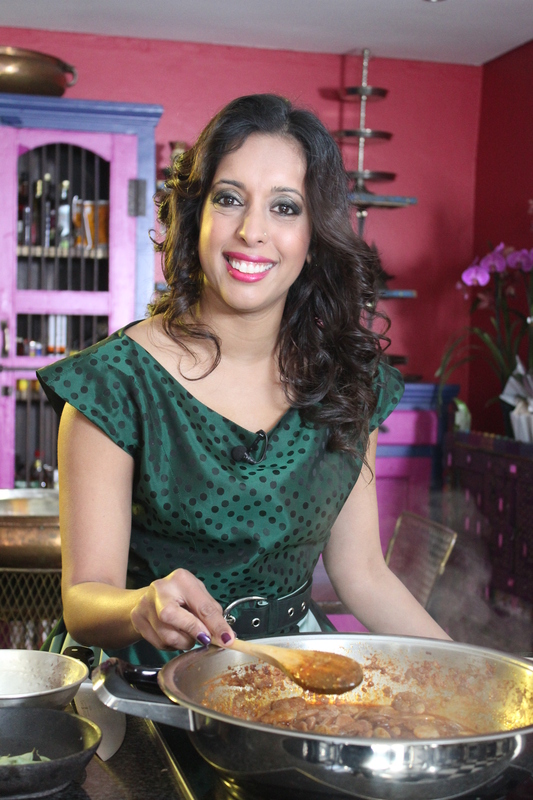 Lower the heat and simmer until the paneer heats through – add a more boiling water if the sauce is too thick. Garnish with curry leaves and fresh coriander. 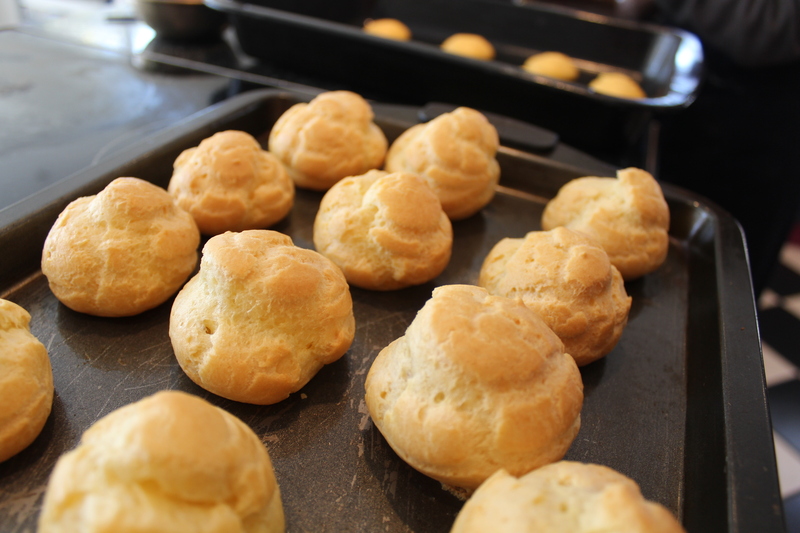 The first time I made choux puffs was when I was about 16 years old. 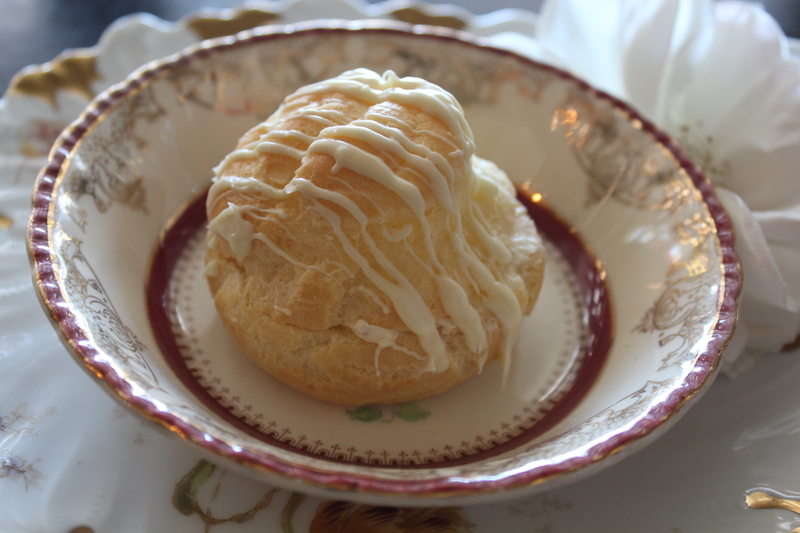 My mom was a huge fan of the Food and Home magazine and there was a feature on choux pastries which I found intriguing. I marched myself to the kitchen with my mother egging me on to make up a batch and they turned out perfect. This started a craze and the Saturday arvie Swiss Roll was replaced by Profiteroles or Eclairs. 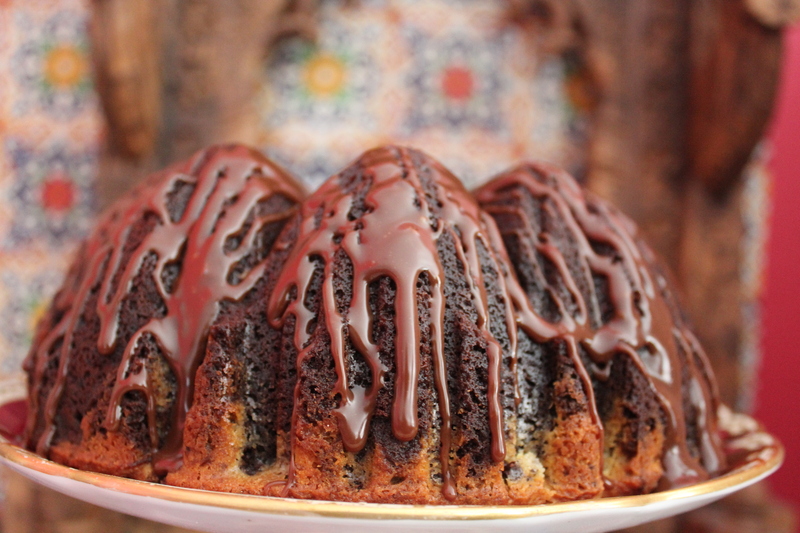 The pastry was filled with scoops of fresh cream and then drizzled with chocolate. For some reason, I can’t even remember why, we just stopped making them. 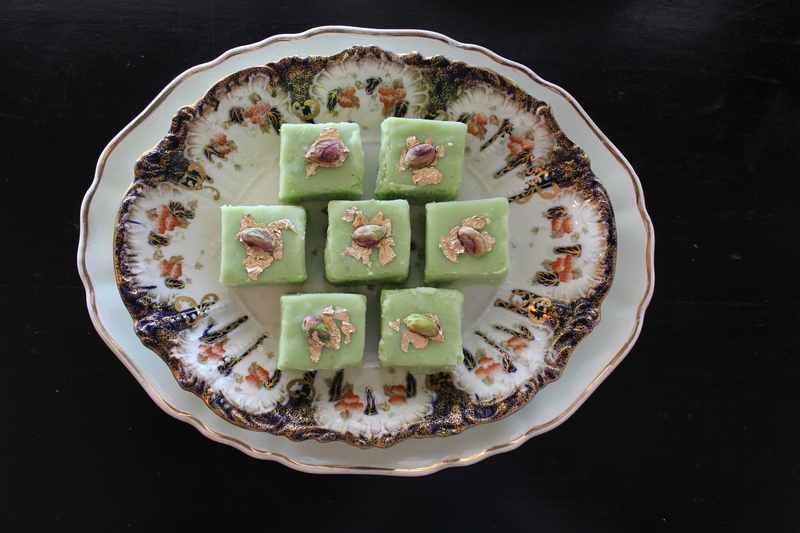 I have been working on some recipes for Eid, and remember that these puffs are a Persian favourite. They are called Nan Khameii. I created these with a fig and mascarpone cream – ordinary whipped cream tends to flop after a bit and makes these pastries go soggy. The thicker the cream, the better the puff. I have tried these with chopped dried figs in the cream but much prefer a swirl of good red fig jam instead. Cooking up the flour butter and water in an AMC pot! Beat the eggs into the mixture, one at a time, beating well after each addition. Pipe the mixture onto a greased baking tray leaving enough room in between them. Drizzle white chocolate over the puff to garnish. 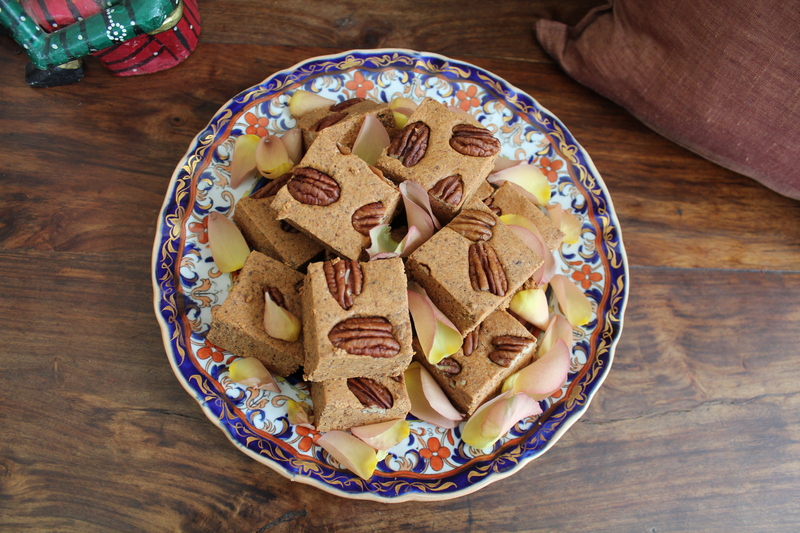 I have been sending out invitations to the next cooking class which will be held this Saturday at the Holi Cow….I am tempted to call these posts ‘The Daily Moos’! There are so many spices that are used in Indian Cuisine and most enthusiastic cooks do find this pretty intimidating. Ground spices are not only for Indian cuisine…ground cumin and coriander is used in mediterranean cuisine as well as Moroccan, Sri Lankan, Turkish as well as Persian cuisine. And the same goes for garam masala, turmeric and red chilli…I love cooking with a pinch of this and a handful of that…the mornings feel crisp and its time to spice things up as Winter approaches…. 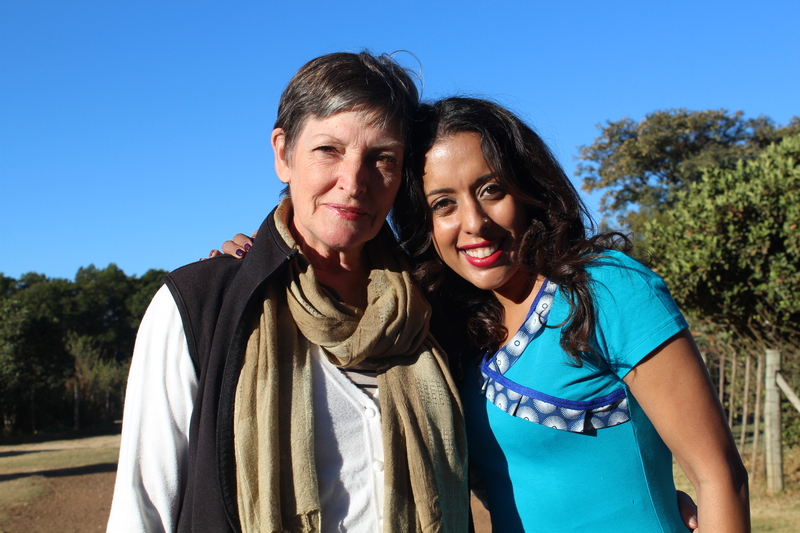 The Curry 101 class takes you through the basics…from which pots to use…how to get started and then I will take you through the ‘Birds and the Bees’ of Indian Cooking. 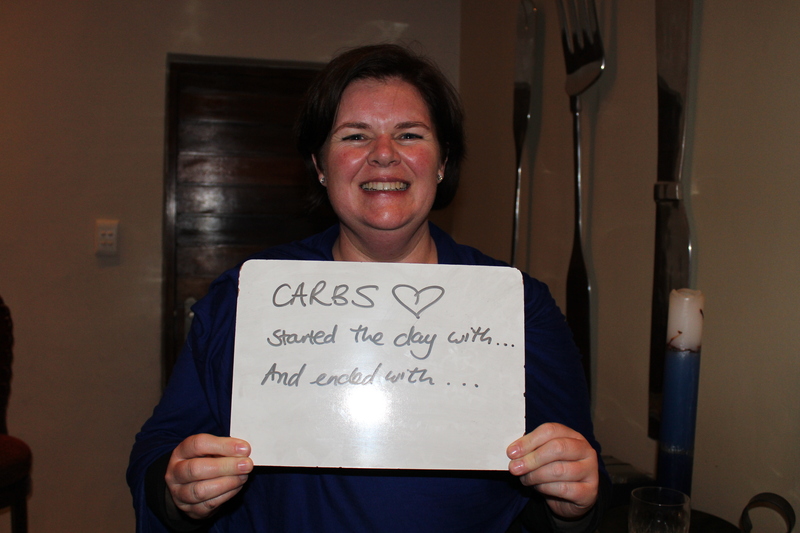 The class will be held on Saturday, 29th March 2014 at the Holi Cow cooking school, 38 Kingfisher Drive Fourways. I do request that guests book and arrive at 10 so we can get cooking by 10.30am..lunch is included and will be served at 12.30. 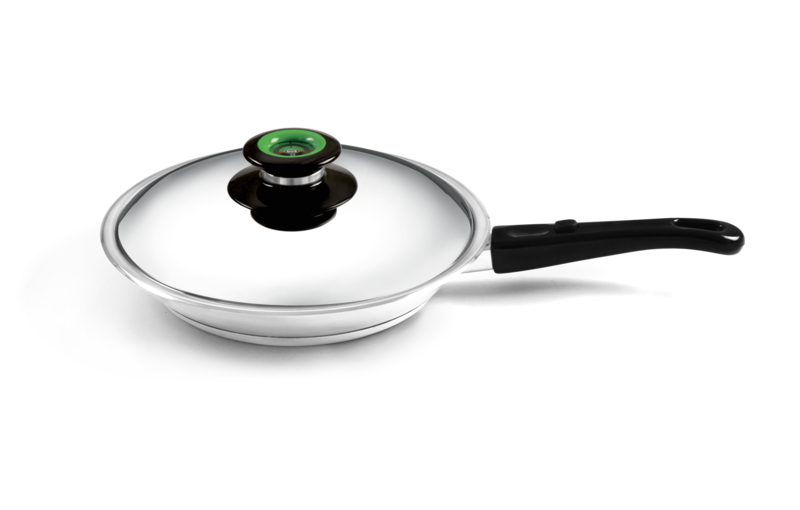 This is a hands on interactive class and you will be cooking in my collection of AMC cookware! Looking forward to seeing you on Saturday. Please do ring us on 011 467 2661 to book. I am almost certain that by now, you have realized that Diwali is not a ‘Diet Friendly’ time of year. And this recipe is no different to any of the other Diwali favourites…a double whammy dish with cream and butter. 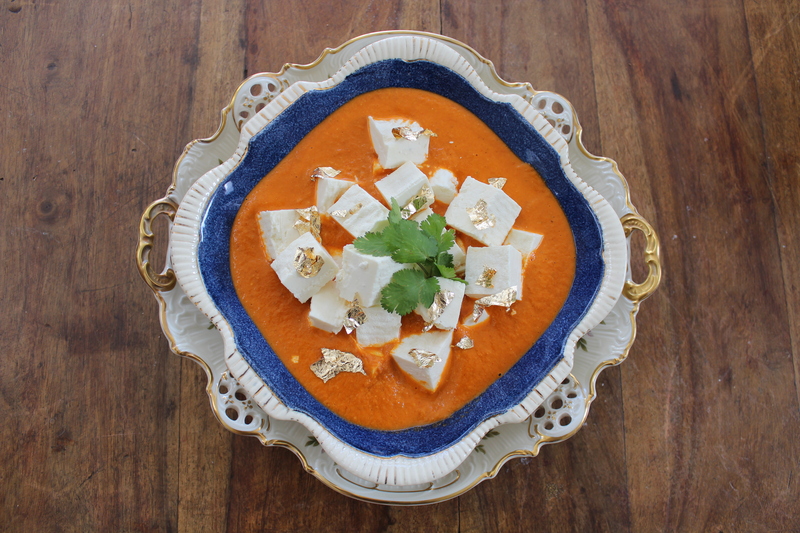 This Paneer Makhani recipe will get you a gold star for Diwali! Slice the paneer into pieces. Soak the cashew nuts in boiling water for 10 minutes and liquidize until smooth. Pound the ginger, garlic and green chilli together. Fry the cinnamon stick, bay leaf and cumin seeds in oil until fragrant. Add onions and salt, saute until light golden brown. Add crushed ginger, garlic and green chilli, then add the red chilli powder. Stir the chopped tomatoes into the spices. Sprinkle in the ground coriander, cumin, garam masala, ground cardamom and turmeric. Simmer until the tomatoes soften completely. Use a potato masher to break down any lumps. Add the cashew paste and 250ml boiling water. 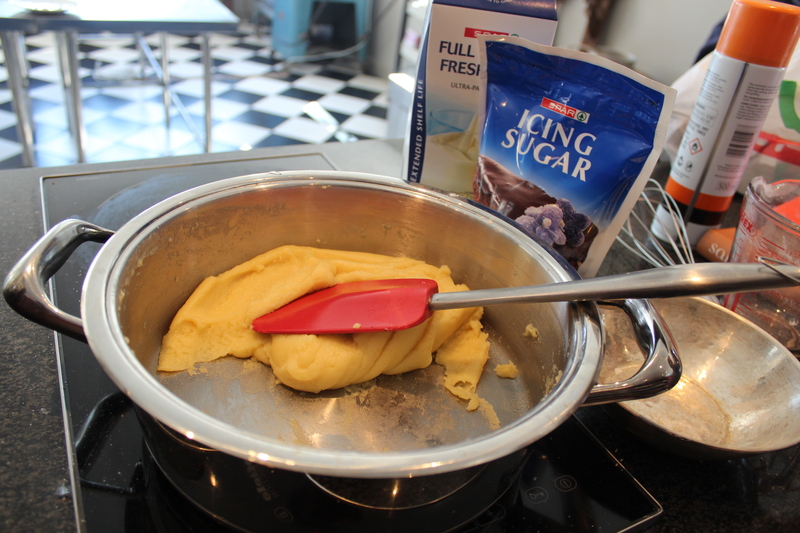 Whisk the cold butter into the sauce, then pour in the fresh cream. Gently place the paneer into the cooked sauce and heat through. Garnish with fresh coriander and edible gold leaf. 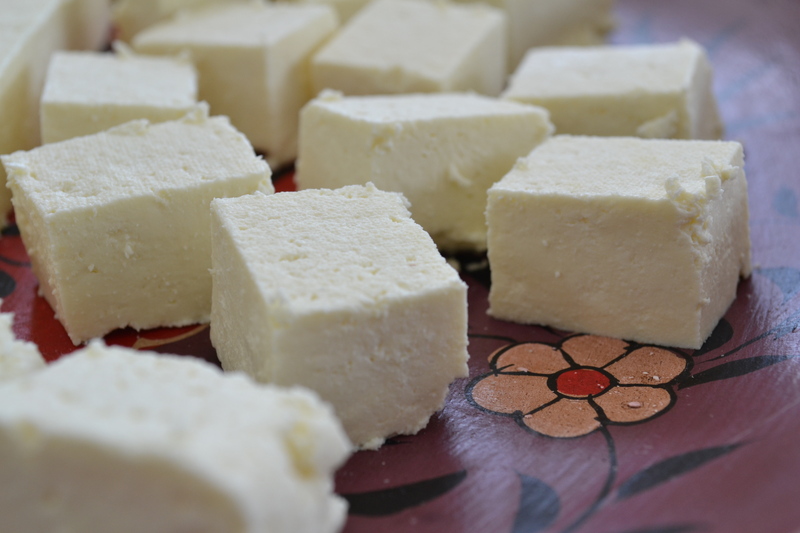 Paneer is an Indian Cottage cheese…it resembles feta but does not contain salt. For vegetarians, this is the equivalent of a ‘lamb curry with mushy potatoes’ (my favourite). I use paneer in pastries, breyanis and even in starters! Please please please, do not use low fat milk – so far, Full Cream Clover milk works best for this recipe. 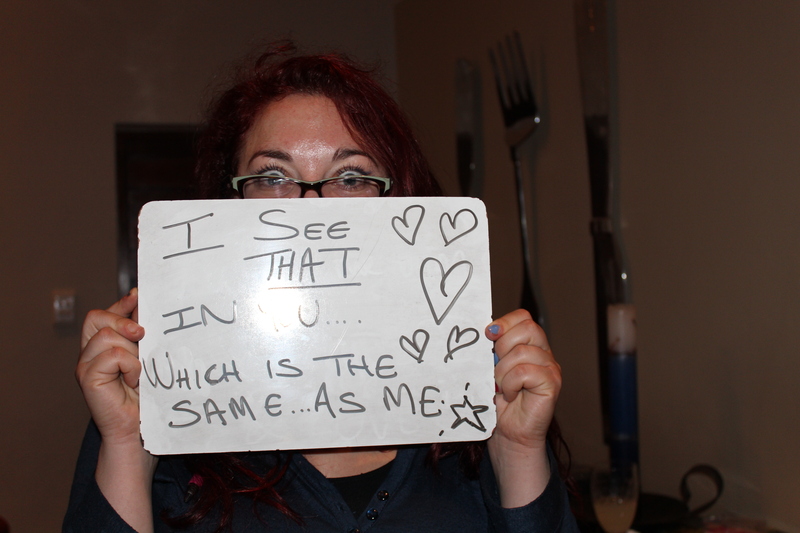 I do experiment a fair bit and this blog is not sponsored by Clover! Use a good pot, (I use AMC cookware) so that the milk does not scorch and burn on the bottom which will ruin the paneer. 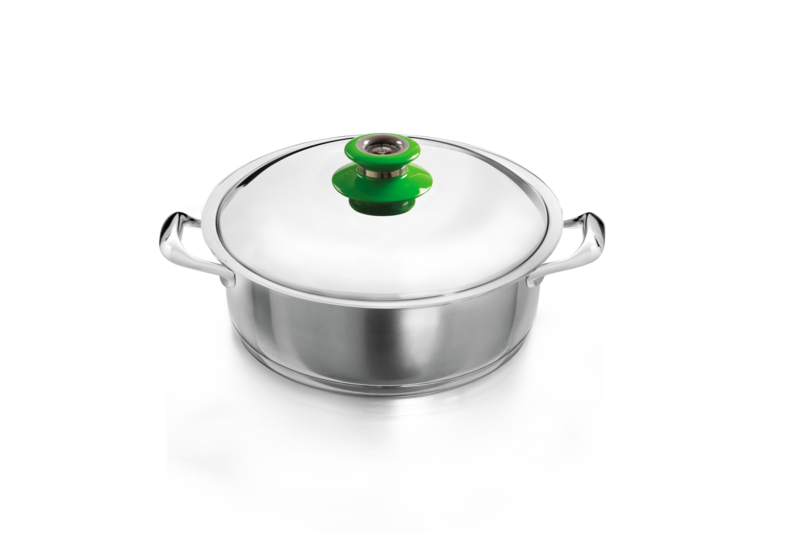 Boil milk in a large 30cm AMC cookware unit and stir continuously to prevent the milk from sticking.